One of the neglected areas of surveillance installations is storage. It’s an area where people often try to cut corners and buy cheaper products, or overuse their systems with the resultant loss of video data and shorter lifespans of the components – like hard drives. Alternatively, in some installations too much storage is purchased because the person who calculated how many megabytes are going to be stored per day didn’t take compression and other factors into account. When calculating the costs of your surveillance storage solution, you will find that it is a significant amount of the overall cost, but it is not something you can cut costs on too much. The length of time you have to save footage will determine how much storage space you need, and getting the right solution will determine how well the system performs with searches and analysis, as well as how much maintenance and support you need over the life of the product. There are two aspects to storage to consider. The one is the high-end solutions that include arrays of hard drives and other components combined into a solution, the other is the hard drives themselves. Hi-Tech Security Solutions looks at each of these with the help of two companies, one an international leader in hard disks, the other a local storage company making waves at the high-end of the market. 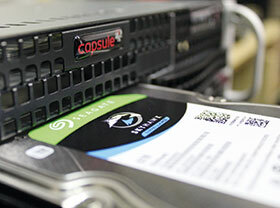 Capsule Technologies, a South African company, has designed its own storage servers to meet the needs of the surveillance market. Instead of using traditional IT storage systems, Franck Martinaux, CTO of Capsule Technologies explains that the company has combined all the storage components into a single box, which can be scaled to meet the requirements of the largest projects. And while it uses standard IT components for its storage, networking and so on, it has developed its own software to take advantage of the hardware and deliver above average performance, even when compared to the best storage systems globally. “The primary idea of Capsule Technologies is to simplify the IT part of a project by reducing the amount of servers and storage arrays required to do the same job,” says Martinaux. Budget: The focus is always on high quality cameras and a high quality VMS, the backend (servers and storage) is never well provisioned and therefore the customer is constrained to adopt a low-cost solution often synonymous of lower quality. “Capsule is breaking the circle by offering solutions with the same level of quality as high-end backend solutions, but its solutions are a third more cost-effective,” he says. Performance: A project is defined with certain specifications, such as a given frame rate and a certain retention period. During the life of the project, it is common that the specifications will evolve: more cameras, higher resolutions, higher frame rates etc. It completely changes the equation of the sizing for the back-end solution. Storage solution providers need to offer a versatile solution that can scale in term of performance and retention, with a minimum impact on the budget. When asked about the difference between the storage we use for general computing purposes and that tailored for surveillance, Martinaux says general purpose IT hardware is fantastic for what it is designed for, which is general usage such as storing emails, documents, pictures etc. “A specialised surveillance storage solution orchestrates the communication with the hard drives for the CCTV workflow. He adds that each VMS out there also has a unique way of communicating with the drives in term of block sizes, scrubbing mechanism, etc. The storage solution selected must be versatile enough to have different profiles of configuration that can be rapidly setup to address the pattern of a specific VMS. He continues that Capsule storage solutions are completely agnostic to the VMS and do not require any plugins. “It is an open surveillance storage solution. In any traditional IT data centre, backups and recovery mechanisms have a special place as these solutions often mean the difference between life and death for companies when hit by a disaster or total system crash. For the IT people in charge, this is also a life or death scenario as they don’t want to face their bosses and tell them that the backups aren’t recoverable, or that there aren’t any. In the surveillance world, backing up your video data has not been as important in the past, perhaps because of the size of the data to protect. Martinaux says that in his experience, there are only few projects that make provision for failover, backups, or disaster recovery. The traditional approach, which consist of sizing for failover servers and storage is working and can be even be implemented at the VMS level with most of the solutions on the market. In addition, he notes that Capsule has developed a failover mechanism between virtual machines, completely cloud ready, transparent to the user allowing a failover / failback mechanism with a latency of few seconds. Taking a look at the other end of the scale, the hard drives themselves, it should be noted that the drives one should use for surveillance are not the same as the drives in a computer, for example. Surveillance projects have extreme writing requirements from multiple cameras all at once and your average desktop hard drive won’t last as long if you set it to this task. Martin Kruger, territory sales, South, East and West Africa for Seagate Technology uses the company’s new SkyHawk AI hard drive as an example. This is the first drive created specifically for artificial intelligence (AI) enabled video surveillance solutions. “New advances in how we use video capture technology require a new kind of support for analytics at the data device level,” Kruger explains. “SkyHawk AI is the first drive that meets this new need. It handles the intensive computational workloads that accompany AI work streams, provides unprecedented bandwidth and processing power to manage always-on, data-intensive workloads, while simultaneously analysing and recording footage from multiple HD cameras. SkyHawk AI’s high throughput and enhanced caching deliver low latency and top-notch random read performance to quickly locate and deliver video images and footage analysis. This enables on-the-edge decision making, eliminating the latency of exchanging cloud-based data and processing. Equipped with Seagate ImagePerfect AI firmware, the drive reliably records high quality, sharp video footage with no dropped frames, while simultaneously facilitating AI-enabled NVR analytics – ensuring that intelligence gathered through video surveillance footage is not lost. Optimised for DVRs and NVRs, SkyHawk surveillance drives are tuned for 24×7 workloads in capacities up to 10 TB. The drive helps to minimise dropped frames and downtime with a workload rating three-times that of a desktop drive and is ready to record up to 90% of the time while supporting up to 64 HD cameras. • Affordability: Let’s face it, the cost for storage solutions is a major chunk of a surveillance project. Our solutions are on average 30% cheaper than our competitions for higher quality. • Scalability: We developed a unique method of optimising the usage of the hardware combined with an optimisation of the data flow for the surveillance applications that results in amazing performance. With the same processing capabilities and the same number of drives as our competitors, we achieve between 50% to 200% more performance depending on the VMS. This is a game changer as it translates into less hardware for the projects and a faster ROI. • Rapid deployment: When you buy a Capsule system, our technical team obtains the specifications of the project (number of cameras, VMS, etc.) and then pre-configures the system. Therefore, the SI has just to plug the unit in on-site and it can be operational in minutes. • Resilience: Our failure rate is less than 1%, and of this 1%, 99% of the cases are due to misuse of the units (absence of power surge protection, exposition to concrete dust, etc.). • Local support: Capsule is a South African company based in the Western Cape. Our customers do not have to log a support call to some kind of portal that will land on the screen of someone overseas. Moreover, 99% of our support calls are resolved within an hour and addressed remotely. We have also a deep knowledge on most of the VMS systems in the market, which avoids the traditional ping-pong game between hardware and software vendors when it comes to support. • Free product evolution: The secret sauce of the Capsule video storage solution is in the software layer, a firmware called CAPS-OS. CAPS-OS is evolving rapidly in performance and features thanks to a very agile team of software developers. Every new version of CAPS-OS offers a higher level of performance, allowing a higher number of cameras to be recorded on the same hardware. For instance, we offer 200% more performance with Milestone compared to what we could have achieved one year ago. The upgrade of the firmware is free. We don’t prevent the user from benefiting from our latest code because their licence has expired. We believe that every customer should benefit from the progress made as we are grateful for their feedback and the direct communication they engaged in with our development team. So, if you thought designing and rolling out a surveillance solution was already complicated, there are a few more issues to consider when deciding on what storage solution you may require, whether it’s a full solution made locally or the individual hard drives that are designed specifically for the way surveillance systems manage video data, you make the choice and reap the benefits or save upfront and pay later. • Franck Martinaux, Capsule Technologies, franck@capsule-sa.co.za, www.capsule-sa.co.za. • Seagate South Africa, Seagate, martin.kruger@seagate.com, www.seagate.com.